The weather here is cold and rainy, so I'm staying in my house today. ;) I have been meaning to do a post about my Inflenster Natural VoxBox and the weather gave me the push to get it done today! Not everything included in this VoxBox is beauty realated but, I figured if I was going to post a few of the things from it I might as well post them all. Pleas click "Read More" to view the entire post. The Original Dish Drying Mat is a unique, laminated design that combines a thin layer of foam between two layers of high quality, super absorbent microfiber for a new dish washing experience that conserves energy and paper towels by air drying, and saves water by hand-washing. The Bad: No complaints here! I love the price and if you receive coupons in the mail for Bed, Bath and Beyond you can get it even cheaper. Created with pure Swedish beeswax, organic shea butter and vitamins A and E for long-lasting, deep-penetrating moisture and lip care protection. LypSyl Intense Protection LypMoisturizer™ helps moisturize, soften and protect your lips naturally. The unique one-hand slide allows for quick application. And, the oversize application tip ensures this ultra- light formula spreads evenly for better lip coverage. The Good: I love this stuff! The weather here has been all over the place, cold one day and then hot the next, and that really dries out my lips. I have been using this product every night before bed and have yet to have a problem with my lips being dry. When I do use this product during the day it stays on for at least 4 hours which is great for me because I always forget to apply lip balm throughout the day. There is a mint flavor to it but, it's not over powering and this product doesn't have a greasy feel like other lip balms can have. The Bad: The packaging is a little bulky compared to standard lip balms tubes. This is something I can look past though because the product works so well for me. Dive into deep freshness. GEODEO® Natural Deodorant Plus Detox Complex™ uses breakthrough eco-technology to help cleanse your pores, releasing the daily buildup of toxins. Reach a new level of purity which keeps you fresh from the inside out for 24-hour odor protection. Naturally-derived invisible solid goes on dry, clear and smooth, leaving no stains or residue. The Good: The smell of this deodorant is very light and fresh and could be used by either a man or woman. The consistency of it is great, I would call it a mix between a gel and a solid. Also, is is invisible so no need to worry about stains showing up on your clothes. The Bad: There is a lot more bad with this product than good! I had my husband test it because he loves trying natural products. Now he doesn't have any major problems with sweating and normally uses a basic deodorant but for some reason, and I tried it once myself and experienced the same thing, this product makes your underarm area very,very dry. I've read reviews where others complained that it didn't stop them from sweating at all, we had the complete opposite reaction. Furthermore, I'm not too sure this product does everything it claims by helping release your "daily toxins". This creamy, sulfate-free bar soap, enriched with luxurious natural and organic ingredients, is gentle enough for the sensitive skin of babies, children and adults. Use daily to cleanse and moisturize. Naturally soothes the symptoms associated with eczema such as inflammation, irritation and itching. Formulated with a special blend of unrefined, "raw" shea butter, argan oil, chamomile extract, frankincense and myrrh. The Good: No one in my family suffers from any skin conditions so, I can't say it does much for clearing up things like eczema but, I do love this product! It has a great light natural scent and does like help keep skin soft. I love that it is made with natural ingredients because I feel more comfortable with letting my little one use it. Life is messy, sticky and germy. CleanWell helps clean it up and kill germs without any unwanted ingredients. These convenient pouches are perfect to pack in a lunch box or carry in your backpack or bag. 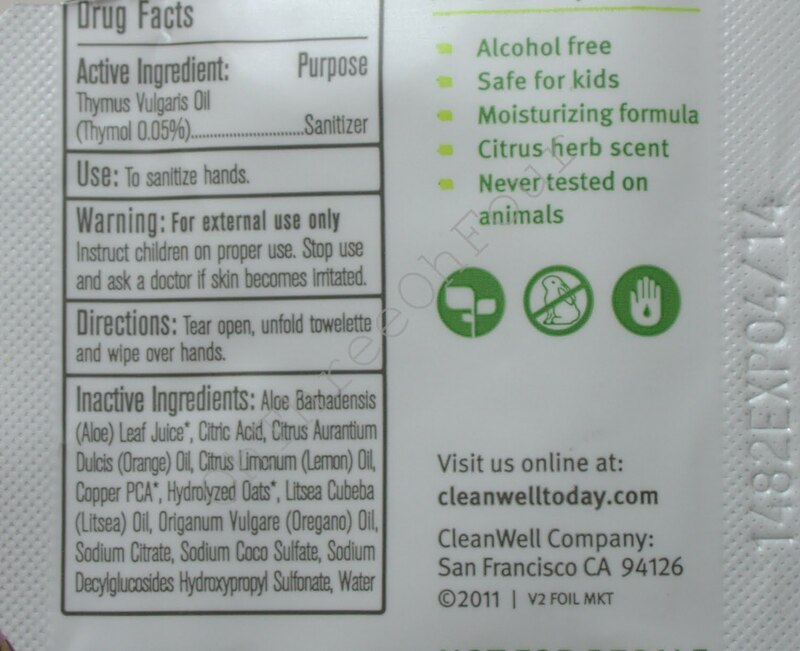 And CleanWell doesn't use alcohol or benzalkonium chloride - so no concerns about dry skin, skin irritation, or irritating Mother Nature. 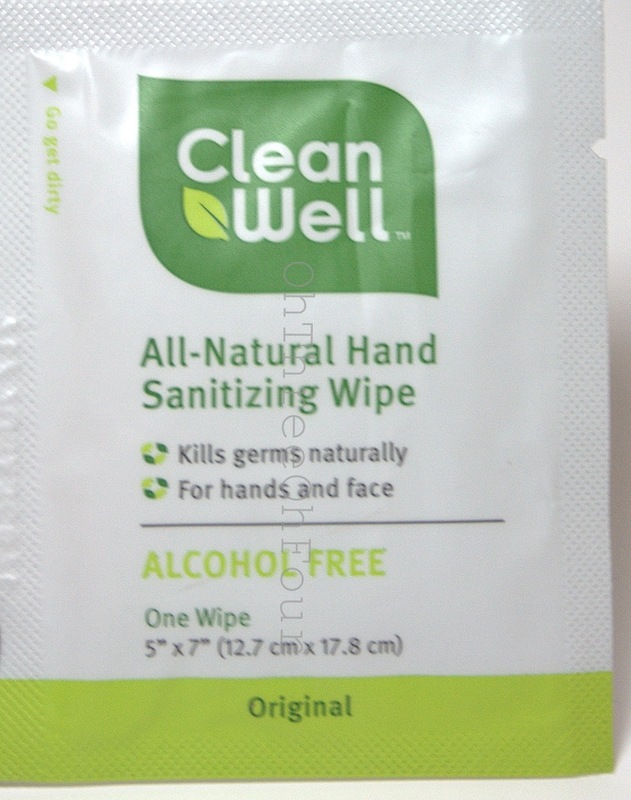 Our all natural hand sanitizing wipes are great for hands (and faces) large and small. The Good: I love the convenience of these wipes, they are easy to keep in your purse or car, and I love how well they work! They don't leave a stick residue behind like other wipes and because they don't contain alcohol, they don't dry out your skin. Usually, I don't feel comfortable using a sanitizing wipe on my son's or my face but, I did with these. The Bad: Personally, the price of these wipes are a too little high for me to repurchase. The way I go through baby wipes with cleaning up my son's face or hands my everyday, I'm sure I would go through a box of these pretty quickly. At $29.99 for 50 pouches that is way too expensive for something I use very frequently. New NECTRESSE™ Sweetener tastes like sugar and is naturally zero calories per serving. How? We started with the deliciously sweet extract of monk fruit and combined it with the perfect blend of other natural sweeteners. It's 100% natural with nothing artificial. You're going to love the way it tastes. The Good: This product has no artificial flavorings and is naturally zero calories. I can't really say too many other good things about it though, I normally don't drink coffee, tea or anything else that would need added sugar. The Bad: I did try this product straight from the package for review purposes. :P Trying in such a manner, it was very "fake" tasting and left a bad taste in my mouth. I would imagine added to something like coffee or tea the taste wouldn't be so obvious though but, I can't say for sure. 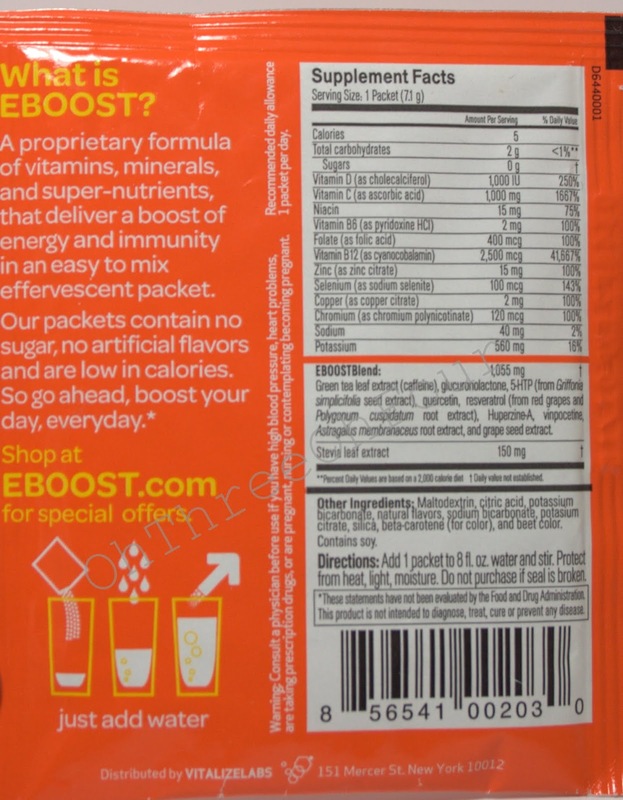 EBOOST uses real ingredients, stuff you’ve heard of like Vitamin C, Vitamin D, Green Tea, Vitamin B-12 and Folic Acid. And the stuff you might not have heard of: Quercetin, 5-HTP, Resveratrol, Huperzine-A — it’s all good too. What could be sweeter than that? Well, we even sweeten our product with Stevia, a plant, not a chemical.Get your boost with the convenience of a shot, or an easy-to-mix powder packet in four delicious flavors: Super Berry, Orange, Pink Lemonade and Acai Pomegranate. No matter how you boost, you’re sure to feel great. All day, every day. The Good: For me, nothing was good about this product. 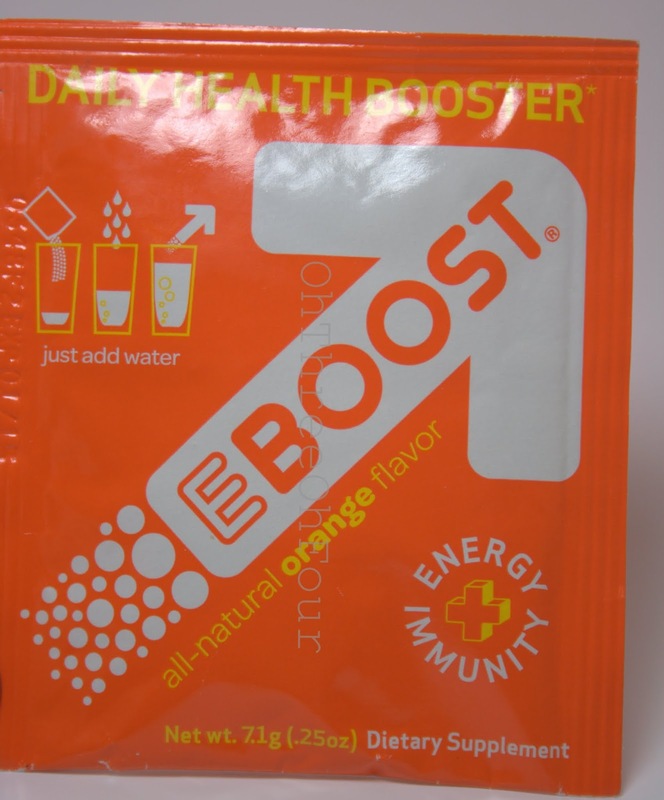 The Bad: I honestly, can't tell you if this product provides the "boost" it says it does. I mixed the packet I received with 8 oz of water and after one sip I knew I couldn't drink anymore. The flavor is very overpowering and the powder did not dissolve completely so it was gritty and chalky tasting. Maybe someone else who uses a lot of powdered mixes would have a better opinion but for me, I would never drink this stuff. And that's my Inflenster Natural VoxBox for the Fall 2012! :) If anyone would like an invite to Influenster let me know and I will send one your way!